A permanent Canadian address is mandatory. If you don’t have one because you are currently residing outside of Canada, then enter the address of a friend or relative living in Canada. Provide the official name of your 2019-20 program of study (e.g. Honours Bachelor of Business Commerce (Accounting); Honours Bachelor of Science (Biochemistry). Consult your college/university’s official documents (or website) to determine the official name of your program. Note: Answer 22 or 22b, but not both. I have submitted a PDF of my university/college transcript to the National Scholarships email address (i.e. by May 31), AND the hardcopy version has been mailed to the BBPA’s office with the expectation it will be received by the National Scholarship no later than June 30. I have not yet obtained my hardcopy university/college transcript. However, my university/college has agreed to mail it directly to the BBPA’s Office so that it is received by the BBPA NS no later than June 30.
c) mail/deliver the hardcopy edition of your transcript to the BBPA NS Office (See the BBPA NS address in Section G), but make sure it is received by the BBPA NS by June 30. Please select and check one. I have submitted my high-school transcript in PDF format to the BBPA NS email address (i.e. by May 31), AND the hardcopy version has been mailed to the BBPA’s office with the expectation it will be delivered no later than June 30. Along with this application, you are required to submit a letter (PDF format only) from a teacher (high school, college or university), guidance counsellor, principal or vice-principal who knows you well and can write about your academic accomplishments and other outstanding attributes. Ideally, this letter should be written on official letterhead. To reinforce your academic standing, we recommend the letter reference any major academic awards you were granted. If you are currently in university/college and prefer having your letter from your former high school, this is acceptable. If you recently changed high school and prefer a letter from your former high school, this is acceptable. This letter should support your case for a scholarship. I will act to submit my teacher’s letter of recommendation, in PDF format, and send it to the BBPA NS via separate email (using the submission process described in Section G). i) Calculate (project if necessary) your income and expenses for the timeframe May 31, 2019 to April 30, 2020. Be as accurate as possible and retain your working notes. Later in the scholarship cycle, you may be asked for details pertaining to your answers. ii) Year 2019-20 income should be based on these sources: employment income, government funding or income support provided directly to you, awards, scholarships, fellowships, bursaries and grants (e.g. OSAP), self-employment, co-op placement income, rental income, parental, spousal or other family contribution, RESP, interest/dividends earned from investments and in-trust accounts, lottery winnings, monetary gifts from a source other than parents and spouse, and court-ordered spousal support alimony payments. iii) Year 2019-20 expenses should be based on these items: mandatory tuition fees, mandatory ancillary fees, text books, residential fees, telecommunication service fees, travel/commuting fees, miscellaneous equipment and supplies, and other. You must complete items i, ii and iii below. You must complete items i, ii and iii below. Here is an opportunity to make a convincing case for financial assistance. In the space below, describe the financial conditions you will encounter during academic year 2019-2020. Here are some issues to address. Describe your financial pressures. What are the financial hardships facing your family and other conditions which may make it difficult for your parents to contribute to your education? What are your prospects for summer earnings and savings? Does your program of study impose extraordinary fees and other costs on you? Will you be taking a loan from a financial institution to cover your studies? Will loan funding from provincial financial aid be inadequate for your needs? At the end of your university/college studies will you be carrying debt and, if yes, what will your projected debt burden? Are you supporting children and/or family? Have you had occasion to suspend your studies due to lack of funding? Do you reside in subsidized housing? At the end, reveal how you plan to give back to the Black community if you are granted a scholarship by the BBPA NS. If you prefer to use 'bullet format' to make your case, please do. In the space below, list a maximum of four occasions when you provided important volunteer service to your community. To build your case, (i) describe the service activity, (ii) the role you performed, (iii) any leadership roles you held, (iv) the duration you were active in this particular activity (by start/stop dates), (v) why you chose this volunteer activity, and (vi) the impact your contribution made. If you prefer to use ‘bullet format’ to make your case, please do. This letter (PDF format only) should be written by someone outside your school but within your community. This person may be an employer, coordinator of volunteer community services, someone from the faith community, a member of the Black community or a leader of an organization to which you belong. Ideally, this person should know you well enough to highlight and verify your record of community service, and also to add context to your family situation and challenges you have faced. If possible, this letter should have an official letterhead. In the space below, list the three most important extracurricular activities you participated in and depict the level of your participation such as recreational, intramural or national level. To build your case, (i) describe the service activity, (ii) the role you performed, (iii) any leadership roles you held, (iv) the duration you were active in this particular activity (by start/stop dates), (v) why you chose this activity, and (vi) the impact your contribution made. If you prefer to use ‘bullet format’ to make your case, please do. This letter (PDF format only) should be written by the Coach, Director, Leader or Organizer of the activity or team. This person should know your record of participation and involvement including your strenghths and abilities you bring. If possible, this letter should have an official letterhead. Describe your record of achievements, commitments and the pathways you are following in support of your responses to Item 34 above. For instance, if you checked ‘entrepreneurship’, outline your history of action and achievements in the area of entrepreneurship. If you are enrolled in a program of study that is clearly linked to one of the above categories, such as law or business, chances are information about your program of study which you noted in Sections B and C are sufficient to reinforce your point. Use the built-in on-line protocol for submitting your application. Immediately thereafter, submit supporting documents in a separate email to the BBPA National Scholarships as noted in Item 35. Submit your application by the deadline of Friday, May 31, 2019.
iv: Your Academic Transcript: PDF format. Should you experience a delay in obtaining your hard copy original transcripts, we will extend the receipt of your transcript to a June 30, 2019 deadline. 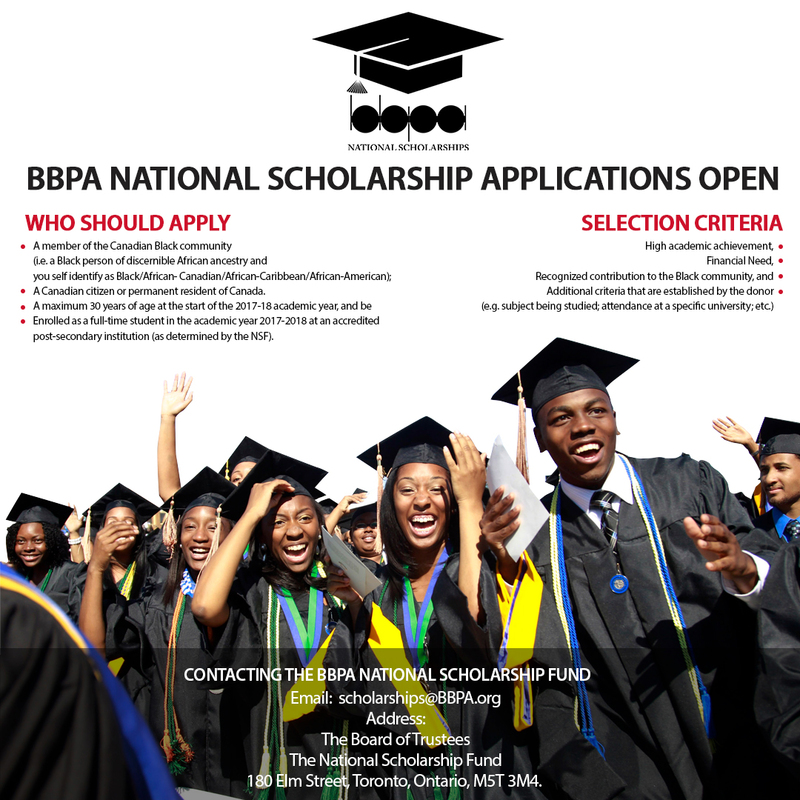 Applications for the 2019 BBPA National Scholarships will be opened. Deadline to submit completed applications for a 2019 BBPA National Scholarship. Decisions regarding 2019 scholarship recipients will be announced. 2019 Awards Ceremony, BBPA National Scholarships. Scholarship recipients will be advised of location. The Fund is managed by a volunteer board of trustees appointed by the Black Business and Professional Association (BBPA) and is operated separately from the Harry Jerome Awards and all other BBPA activities. Sponsored or Named Scholarships funded directly by corporations or individuals in the name of the corporation or individual; or established in the memory of a relative. The Legacy Scholarships are funded from donations to the General Fund and investment income from the Endowment Fund. In 2016 the BBPA granted 46 new and renewable scholarships valued close to $150,000. Over the past 30 years the BBPA Scholarship Fund granted approximately 950 scholarships totalling $3.6 million. For 2016 we welcome the following first time donors: The Toronto Police Chief Mark Saunders, Sun and Partners and D’Juvayne Christian. We are especially grateful to those organizations and individuals who have made a generous gift to our endowment fund. Thanks to Dr. Miriam Rossi and Renato Rossi for their generosity in funding four or more scholarships consistently, for so many years. We thank all our sponsors for their contributions to the education of Black youth through the BBPA National Scholarships. No donation is too small to make a difference! Donate to the BBPA National Scholarships and help Black youth realize their dreams! Donations may be made by cheque to BBPA National Scholarship Fund and mailed to the Fund at 180 Elm, Toronto, Ontario M5T 3M4 or by calling the Fund at 416-504-4097. The following scholarships are available to Canadian students attending accredited universities or colleges who satisfy the eligibility criteria. Please refer to the overall BBPA National Scholarships eligibility criteria. BBPA Legacy Scholarships are established in the name of Black Canadians who enriched Canada with their contributions in the arts, the professions, science, business, technology, politics and other areas of endeavour. Each scholarship is in the amount of $1,000.00 – $2,000. BBPA Legacy Scholarships are funded by general donations and investment income from the endowment fund. The Toronto Community Housing /Leaders of Tomorrow scholarships valued at $1,000 – $2,000 each are available to students from Toronto Community Housing / high priority neighbourhoods in the Greater Toronto Area who are attending an accredited Canadian university or college. (1) This $1,500.00 scholarship is sponsored by Ms. Pauline Christian, President of the BBPA in memory of her mother the late Queen Victoria Wellington-Wint. Scholarship to be awarded to a student with strong academics, health/fitness consciousness, demonstrated financial need, and who has made a recognized contribution in his/her community. Ms. Christian will participate in making the decision regarding the recipient of her scholarship. (1) is a $1000.oo scholarship sponsored by D’Juvayne Christian, for a student interested in entrepreneurship or Real Estate Investments . The student must be entering first year post secondary studies, with strong community involvement, academic record and financial need, in this order stated. The successful applicant would meet the BBPA’s National Scholarship Fund eligibility criteria as well. Mr. Christian will participate in making the decision regarding the recipient of his scholarship. (1) is a $2000.00 scholarship sponsored by the BBPA to honour Harry Jerome, an outstanding Black Canadian who was an Olympian, Officer of the Order of Canada and world renowned for his sports achievements. Equally respected for his dedication to educational and athletic opportunities for youth, Mr. Jerome was invited by Prime Minister Pierre Eliot Trudeau to help create and serve as a senior administrator in the Canadian Ministry of Sport. Reflecting this criteria, this scholarship is to be awarded to an applicant 18 years or older who has demonstrated superior achievement in academics, athletics and his/her involvement in helping those who need, assistance or support in the Black community. (1) The Dr. Anderson Abbott Scholarship, for $4,000.00, is for a University of Toronto student enrolled in a Health Science program at the University of Toronto. The University established the scholarship in recognition of Dr. Abbott, the first Black medical doctor to graduate from a Canadian university and an army physician/surgeon for the North in the American Civil War. For his dedication and valor, he was given a special gift, President Lincoln’s Inauguration Shawl, by Mary Todd Lincoln, the wife of the U.S. Established in 2008 by Queen’s University in cooperation with the Black Business and Professional Association (BBPA),and the former Harry Jerome Scholarship program, to honour Robert Sutherland (BA, 1852), the first student of African heritage to graduate from Queen?s University, Ontario, Canada. As per Queen?s University, the funded scholarship is awarded to a Black student entering the first year of any direct-entry undergraduate degree program at Queen’s University, on the basis of demonstrated financial need, academic achievement and contribution to the community or other volunteer activities. (2) Two scholarships, for $5,000.00 each, are sponsored by the Bank of Montreal, each to be awarded to a student with academic achievement, financial need, demonstrated social responsibility through community work, and an interest in a business career. (2) Sponsored by the Royal Bank of Canada, two scholarships in the amount of $4,000.00 each are offered. (2) The Bank of Nova Scotia sponsors two scholarships of $5,000.00 each that are to be awarded to two students attending a Canadian college or university enrolled in Business studies. They should have strong academics, demonstrated financial need, leadership skills and commitment to helping in their community. for $2,000.00, (1) is sponsored by Mr. Konata Lake, former recipient of more than one BBPA scholarship. He sponsors the scholarship in honour of his mother, Mrs. Gordon, for her support through his many years of studies. Mr. Lake has asked that the scholarship recipient be a graduate of C.I., C.W. Jeffreys, Emery Collegiate Institute, or of other Jane-Finch at risk? high schools in Toronto. (1) Sponsored by Dr. Leebert A. Wright in the name ofthe late Dr. Ouida M. Wright, who had a lifelong aspiration for higher education and who aided and inspired thousands of young people to make education a worthwhile goal. This $4,500.00 scholarship will be awarded to a female student who has been accepted into a post-secondary degree program in one of the sciences such as mathematics, physics, chemistry, biology or medicine. (1), for $1,000.00, sponsored by the Toronto Police Police Chief Mark Saunders, Toronto Police Service’s first Black Chief of Police. The scholarship is awarded to a student enrolled at an accredited university or college in Canada as a full-time student in diploma or degree program leading to a career in law enforcement. 1. The Hon. Lincoln Alexander Scholarship (1) is in honour of the widely respected first Black Lieutenant Governor of Ontario, who continues to emphasize the need for fairness and equity for all citizens. 2. The Herb Carnegie Scholarship (1) honours the late Mr.Herb Carnegie, an outstanding athlete who fought against systemic obstacles to be acknowledged as a first rate hockey player. He was awarded the Order of Canada, to recognize his contributions helping many youth overcome obstacles to their success. 3. The Portia White Scholarship, in the musical arts (1) in honour of the late Ms. Portia White, a renowned opera singer in past decades, who overcame personal obstacles to establish an out-standing musical career. 4. The Al Hamilton Scholarship (1) honours the late Al Hamilton, journalist, founder of an ethno-cultural newspaper for the Black community, and a respected community activist. 5. The Beverley Mascoll Scholarship (1) honours the memory of Mrs. Mascoll, a well known and respected entrepreneur who often helped out less fortunate members of our community. 6. The Hon. Michaelle Jean Scholarship (1) honours the first Afro-Canadian Governor General. After the expiration of her appointment in September 2010, she continues to contribute significantly to humanitarian issues. She was named UNESCO Special Envoy for Haiti, immediately after her term. First Generation Scholarships of $1,000.00 – $2,000.00 are available to students whose parents have not participated in post-secondary education studies are granted to individuals who are the first in his/her family to attend university. 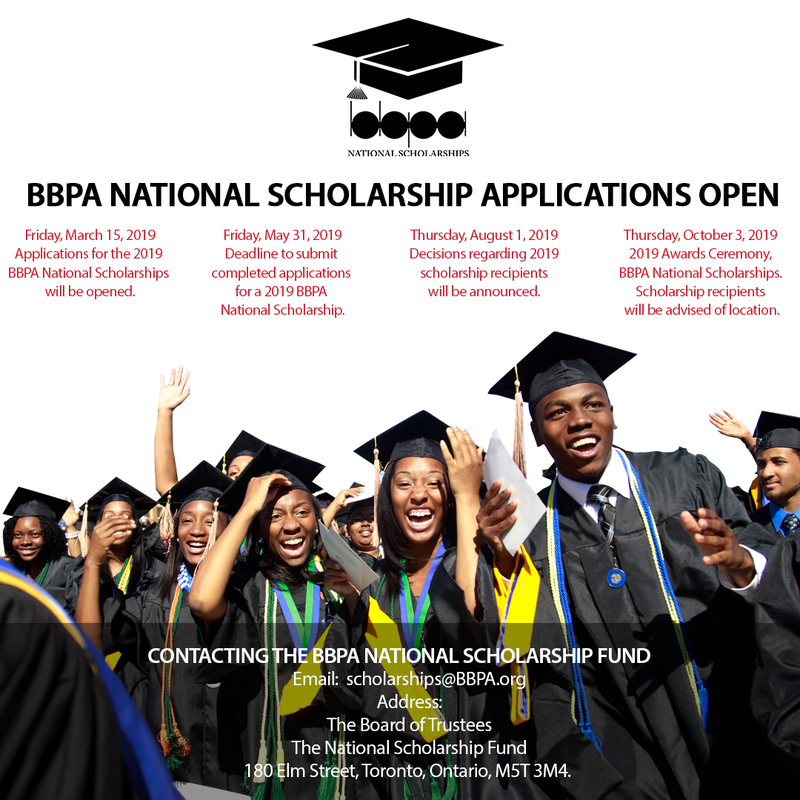 Students must be residents of Ontario and must meet all other eligibility criteria of the BBPA National scholarships. First Generation Scholarships are funded by an endowment established with the proceeds of a grant from the Government of Ontario. Four Toronto Community Housing / Leaders of Tomorrow scholarships valued at $1,000.00 – $2,000.00 each are available to students from high priority neighbourhoods in the Greater Toronto Area who are attending an accredited Canadian university or college. (1) for $2,000.00, is sponsored by the BBPA, in honour of Mr. Gairey’s important role as a community activist and his many valuable contributions to the Black community over the years. (1) $1,000.00 is for a student at risk of being forced to leave his/her studies due to exceptional financial need and no possibility of other financial help. Sponsored by BBPA. is sponsored by a group of Antiguans and Barbudans forming the Madeline Blackman Scholarship Committee. A $3000 scholarship is granted to a student that is from the Antigua and Barbuda community, has a positive academic performance, studies in the arts or fine arts, and has a financial need. (2) Sponsored by Mr. Denham Jolly, founder of the BBPA in the amount of $3,000.00. The two scholarships are awarded to student who are from a sole parent family or who are single parents themselves and are enrolled a full-time Nursing program. BBPA in partnership with the Government of Ontario sponsor scholarships in the STEM field. A scholarship will be rewarded to students who show a strong aptitude in Science, Technology, Engineering and/or Math and who are studying to become tomorrow’s scientists, engineers and inventors. Donate to the BBPA National Scholarships and Support Tomorrow’s Leaders!